Reed, Tosh, Wolford and Douglass is located in Beaver, PA—the county seat of Beaver County, immediately adjacent to the Beaver County Courthouse. 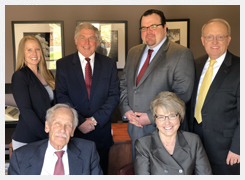 For over a century, our firm has provided legal services to families and businesses in Beaver County. Our firm traces its roots to the law practice of John Frank Reed, who was admitted to practice on September 14, 1887. John Frank Reed was succeeded by his son Harold F. Reed in 1913, and his grandson Harold F. Reed Jr. in 1951. Our firm today brings together seven lawyers with diverse backgrounds and a broad range of experiences and strengths. Working together as a firm, we endeavor to complement each others learning and experiences for the the benefit of all of our clients.